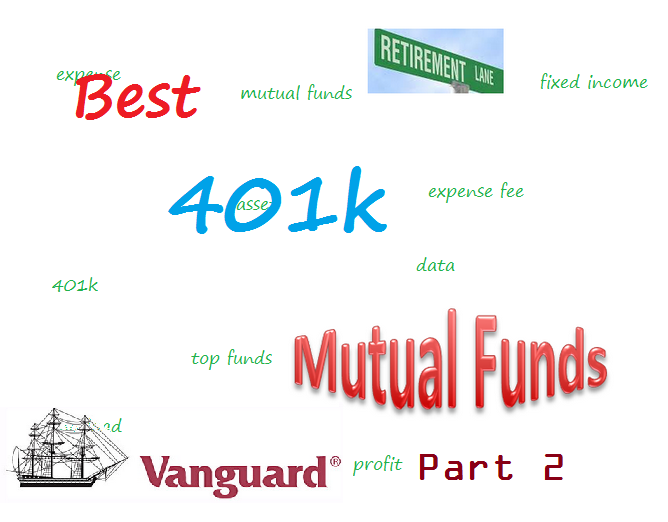 This post is part 2 of Vanguard’s best 401k funds article. The top funds are Vanguard 500 Index Fund, Vanguard Wellington Fund, etc. Vanguard Group is a popular asset management firm. It manages more than $3 trillion of investment assets. As one of the largest players in 401(k) plans, Vanguard has lot of high rated mutual funds for your 401k account. As described in my part 1 article, these best Vanguard’s mutual funds for your retirement account are selected based on its management, popularity & performance for the past decade. Some of these funds are ranked among the best in their category. They are also being recognized by popular financial magazine such as US News, Barron, Forbes, Morningstar, etc. This Vanguard 500 Index Fund is tracking the S&P 500 index. The fund has assets totaling almost $204 billion invested. Its expense fee is only 0.17%. The portfolio turnover rate is 3%. The current dividend yield is 1.97%. The fund is part of Morningstar’s Large Blend category. The fund manager is Michael Buek. As one of Vanguard’s best 401k funds, this equity fund has returned 13.21% over the past three years, 13.93% over the past five years and 6.78% over the past decade. In 2015, it has year to date return of -5.44%. As of September 2015, the top 5 stocks in its portfolio are Apple Inc, Microsoft Corp, Exxon Mobil Corporation, Johnson & Johnson, and Wells Fargo & Co. Top 3 sectors are technology, healthcare, and financial services. Vanguard Wellington Fund is a popular moderate allocation balanced fund. It invests mainly in dividend paying common stocks (60-70%) and fixed income (30-40%). The fund managers are Edward P. Bousa and John C. Keogh. This fund has low expense fee of 0.26%. It has $89 billion of assets. This best 401k fund is ranked with 5 stars and gold rating by Morningstar. In 2015, it has year-to-date return of -4.07%. This top mutual fund has returned 9.14% over the past 3 years, and 9.79% over the past 5 years. If you are closed to retirement age, you should consider Vanguard Target Retirement Income Fund. This fund is part of fund of funds. The fund invests in other Vanguard mutual funds according to an asset allocation strategy designed for investors currently in retirement. With assets of $10 billion, it has an expense fee of 0.16%. This top 401k fund is ranked with 5 stars rating by Morningstar. It has a dividend yield of 1.87%. This Vanguard fund has a 3 year annualized return of 3.92%. Vanguard International Growth Fund has a dividend yield of 2.37%. The annual expense fee is 0.47%. This actively managed fund has no sales load. It is ranked with 3 stars rating. This top fund invests mainly in stocks of companies located outside the United States.